To start out, from a juridical standpoint the case of the Cuban Five has run its course. We’re now turning to an extraordinary proceeding called Habeas Corpus, which is an opportunity that is available only once to convicted persons after they have exhausted all appeals. Here we have to take into account that historically the chances of our compañeros being freed this way are extremely remote. However, we’re taking this step for two basic reasons. First of all, it’s a matter of principles: We have to wage this battle on every front that we can, because these are five innocent men who are suffering cruel and unfair imprisonment. Second, because only in the case of judicial decisions has it become possible, even partially and in a limited manner, to break through the iron-clad censorship that the mass media have imposed on this case. I could have also begun this talk by saying that the present situation of the Five is identical to that which they faced thirteen years ago. There’s no news about them. They are suffering a double imprisonment: That imposed by their jailers, and that imposed by journalists. The first thing we have to ask is why the media silence? Is it that Cuba, its Revolution, its problems, have been of little or no media interest? As you well know, it is very much to the contrary. Our country has received and keeps receiving attention incomparably greater than that given to other countries of this continent. They analyze us day and night under powerful spotlights and magnifying glass, almost always distorting the most diverse aspects of our reality. So, why do they hardly ever say anything about this case? If the Five had committed a crime, if any one of them had done, or tried to do, something against the American people, does anyone have the slightest doubt that they would have been a constant topic in the anti-Cuban propaganda? The truth is that the Five are completely innocent and are literally, without exaggeration, heroes who have sacrificed their lives to save ours, showing an unsurpassed altruism. This is not an exercise in rhetoric. This truth is proven in official U.S. government documents and in its courts. Their mission to try and discover terrorist plans against Cuba is plainly stated in numerous official documents ranging from the initial indictment brought against them and the prosecution's various motions at the commencement of the trial and throughout its development, to the sentences that were imposed on them upon conclusion. That the U.S. government's aim was to protect the terrorists was also acknowledged in those documents and in the prosecution's repeated statements, all of which is recorded in the court transcripts. The big problem that we face is that the Empire has managed to keep this information from reaching the people. Its success has been remarkable. They have been able to hijack the truth with impunity. I’m not talking about secret texts or confidential documents. I’m talking about documents which have been and are available to anyone who goes to the official website of the Federal District Court for south Florida and looks up the case of “United States vs. Gerardo Hernandez et al.” But this is only done by some specialists or particularly interested individuals. As I said, right now we’re engaged in the Habeas Corpus petition. The most difficult case is that of Gerardo, to which I’ll refer later. But there is a common element in all their appeals, regarding the conduct of the press. While in the rest of the world it was completely ignored, in Miami the trial received overwhelming and strident coverage from the local media that promoted a climate of hatred against the defendants. There were even threats and provocations against jurors, attorneys and witnesses. The judge herself repeatedly complained and asked the government to put an end to a situation that clearly violated due process norms. This was one of the factors behind the unanimous decision in 2005 by the Appeals Court panel to toss out the whole farce and order a new trial, a just decision that was later reversed under pressure from the Bush Administration. The following year, in 2006, it came out that these Miami “journalists” were in fact being paid by the government to carry out this sleazy job. For five years now, American private groups have been demanding that the authorities reveal everything that they are still concealing about the scale of this million-dollar operation—how much was paid, to whom, and for that—in a cover-up that would be more than sufficient to declare the whole legal process against our comrades null and void. However, here I have a document dated May 30, 2001 from the U.S. Attorney’s office. Here they state that the charge could not be proven, and therefore they requested to withdraw it at the last minute. In spite of this, Gerardo was found guilty of a non-existent crime that was impossible to prove, and moreover, for which he was no longer accused. But, what does it matter that this document exists if nobody talks about it? 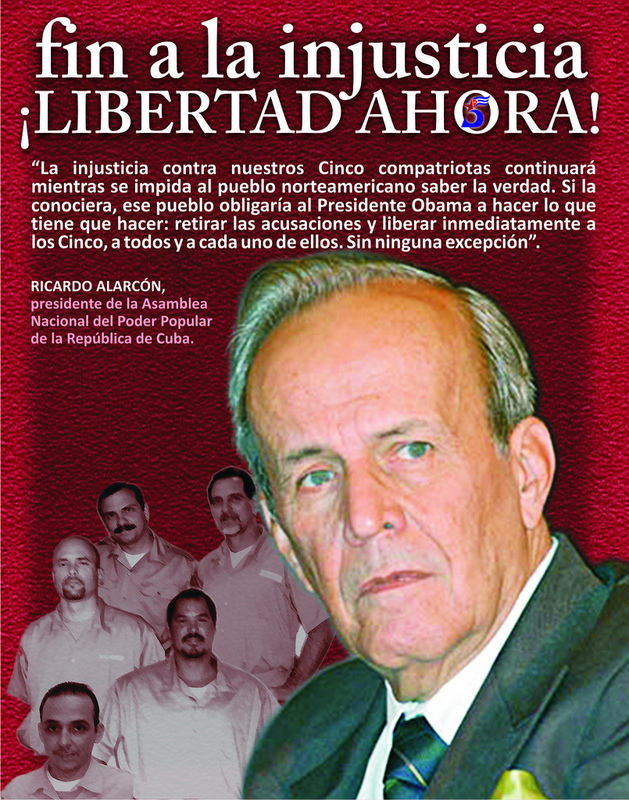 Gerardo was falsely accused of having participated in something that he had absolutely nothing to do with: The Feb. 1996 downing of 2 aircraft over Cuban waters, belonging to a terrorist group which systematically dedicated itself to violating Cuban territory, announcing each violation and shamelessly bragging about it in the Miami media. Independent of the fact that this document is irrefutable proof the accusations were unsustainable, there is another very important fact that illustrates the transgression of the American authorities. In order to claim legal jurisdiction over the incident, the United States had to prove that it had occurred outside of Cuban airspace. Cuban radars recorded the incident inside our territorial waters very close to the city of Havana. The U.S. radars offered confusing and contradictory data. An International Civil Aviation Organization (ICAO) investigative mission requested images taken by U.S. satellites, but Washington refused to release them. During the Miami trial the defense reiterated this request and the government once again refused. Now, Gerardo is again requesting this information for his Habeas Corpus, and Washington is again refusing to allow anyone to see these images. It's now more than 15 years of cover-up, which clearly proves the fraudulent nature of the U.S. government charges. But Washington has succeeded in not being denounced by anyone, allowing it to continue deceiving many. Yet any even minimally objective approach to this problem must recognize that we are still very far from this goal. It is a proven fact that the giant media corporations have imposed an absolute silence around this case, that is especially rigorous within the United States itself, where the vast majority of the population knows absolutely nothing about the case. The complete lack of reporting on this theme does not reflect any professional incompetence on the part of journalists, but rather obeys precise instructions, a political decision to silence it, made at the highest levels in Washington. To hope that these censors will change their attitude is senseless illusion and would be an exercise in self-deception. To denounce them over and over is right but it is not enough, because our repeated denunciations have barely had any effect at all. But there is much, much more that we can and must do. First of all, we have to objectively take into account the reach that it has today - what we should call by its proper name: the global media tyranny. We’re not only talking about what leading newspapers say or cover up, the big TV networks or the news agencies that decide what news will be broadcast around the world. All of them, united in enormous monopolies, control and manipulate information and their influence even extends to would-be alternatives to this global dictatorship, including media that defines itself as revolutionary. There are many people in this world who strive to speak out and to be heard with very limited resources, and who have occasionally penetrated the wall of disinformation and deception. Our resources are much greater, those of the Cuban universities, the professors and students. A talk delivered at the Cuban University of Information Sciences (UCI), Havana, July 20, 2011. El tema que me han asignado para este seminario se titula “Situación actual del caso de nuestros Cinco Héroes”. Comenzaré diciendo que desde el punto de vista jurídico ha concluido ya su curso normal. Acudimos ahora a un procedimiento extraordinario, el llamado Habeas Corpus, que es una oportunidad que se ofrece por una sola vez a los condenados después que agotaron sin éxito todos sus recursos apelativos. Si se toma en cuenta los antecedentes son muy remotas las posibilidades de obtener por esta vía la liberación de nuestros compañeros. Damos este paso, sin embargo, por dos razones fundamentales. La primera es una cuestión de principios: debemos librar esta batalla en todos los terrenos que podamos pues se trata de cinco inocentes que sufren injusta y cruel prisión. La segunda es que sólo alrededor de decisiones tomadas en instancias judiciales se ha logrado quebrar, aunque sea parcial y limitadamente, la férrea censura que los grandes medios de comunicación imponen a este caso. También podría haber iniciado esta charla diciendo que la situación actual de los Cinco es idéntica a la que encaran hace trece años. Sobre ellos no hay noticias. Sufren un doble encierro, el de sus carceleros y el de los periodistas. La primera reflexión que habría que hacer es ¿por qué ese silencio mediático? ¿Es que Cuba, su Revolución, sus problemas, han sido temas de escaso interés para esos medios? Ustedes saben que es al revés. Nuestra Patria ha recibido y recibe una atención incomparablemente mayor a la de otros países del Continente; se nos analiza día y noche bajo potentes reflectores y poderosas lupas que tratan, casi siempre distorsionando, los más diversos aspectos de nuestra realidad. Entonces ¿por qué casi nunca han dicho algo sobre este caso? Si los Cinco hubieran cometido algún crimen, si alguno de ellos hubiese hecho o intentado hacer algo contra el pueblo norteamericano ¿tiene alguien la menor duda de que ellos habrían sido tema constante en la propaganda anticubana? La verdad es que los Cinco son completamente inocentes y son literalmente, sin exageración alguna, héroes, que han sacrificado sus vidas por salvar las nuestras, dando una prueba de altruismo insuperable. No hago un ejercicio de retórica. Esa verdad consta en documentos oficiales del gobierno de Estados Unidos y de sus tribunales. Que su misión era tratar de descubrir los planes terroristas contra Cuba está con todas las letras en numerosos escritos, desde el Acta acusatoria inicial formulada contra ellos y en varias mociones de la fiscalía al comienzo del juicio y a lo largo de su desarrollo hasta las sentencias que al final les fueron impuestas. Que el propósito del gobierno norteamericano era proteger a los terroristas fue reconocido también en esos documentos y en repetidas intervenciones de la fiscalía, todo lo cual está registrado en las actas del tribunal. El gran problema que enfrentamos es que el Imperio ha logrado impedir que esa información trascienda a la gente. Su éxito es notable. Ha podido secuestrar la verdad impunemente. No hablo de textos secretos o confidenciales. Me refiero a documentos que han estado y están disponibles para quien acceda al sitio oficial del Tribunal Federal del Sur de la Florida y busque el caso “Estados Unidos versus Gerardo Hernandez et al.” Pero eso sólo lo hacen algunos especialistas o personas particularmente interesadas. El gran público se entera de lo que sucede en los tribunales por las versiones que quieran darle los llamados “medios de información”. Y de este juicio, el más prolongado de la historia de un país que, entre otras cosas, tiene varios canales de televisión y otras publicaciones dedicadas exclusivamente a los tribunales, nada se dijo fuera de la ciudad de Miami. Debo detenerme en este punto. Como ya les dije estamos ahora enfrascados en la presentación de los recursos de Habeas Corpus. El caso más difícil es el de Gerardo al cual me referiré más adelante. Pero hay un elemento común en la apelación de todos ellos que se refiere a la conducta de la prensa. Mientras en el mundo entero era ignorado completamente, el juicio tuvo en Miami una desbordada y estridente cobertura de los medios locales que promovieron un ambiente de odio contra los acusados, pero además amenazaron y provocaron a los miembros del jurado y a los abogados y testigos. La propia jueza se quejó varias veces y pidió al gobierno que pusiera fin a una situación claramente violatoria de las normas del debido proceso. Ese fue uno de los factores que llevó a la decisión unánime del panel de la Corte de Apelaciones en el 2005 de anular aquella farsa y ordenar un nuevo juicio, justa decisión revocada después por presiones del gobierno de Bush. Al siguiente año, en el 2006, se supo que esos “periodistas” de Miami eran pagados por el Gobierno para realizar su deleznable faena. Desde hace 5 años grupos de la sociedad civil norteamericana reclaman a las autoridades que revelen todo lo que aún ocultan sobre el alcance de esta operación millonaria – cuánto pagaron, a quiénes y para qué – en una conjura cuyo descubrimiento es más que suficiente para declarar nulo y sin valor alguno todo el proceso seguido contra nuestros compañeros. Contra Gerardo se levantó una acusación adicional, una calumnia infame que es la causa por la que fue sentenciado a morir dos veces en prisión. Lo acusaron de “conspiración para cometer asesinato en primer grado”. Sin embargo aquí tengo este documento fechado el 30 de mayo de 2001. Es de la Fiscalía General de Estados Unidos. Aquí dicen que no podían probar esa acusación y por ello solicitaron retirarla a última hora. Pese a ello, Gerardo fue declarado culpable por un crimen que no existió, que era imposible de probar y, para colmo, por el que ya no lo acusaban. Pero ¿qué importa que este documento exista si nadie habla de él? Se acusaba a Gerardo falsamente de haber participado en algo con lo que él no tuvo absolutamente nada que ver: el derribo en febrero de 1996 sobre aguas cubanas de dos aeronaves de un grupo terrorista que se dedicaba sistemáticamente a violar el territorio cubano y anunciaba cada violación y las pregonaba sin pudor en los medios de Miami. Independientemente de que este documento es prueba irrefutable de que la acusación era insostenible hay otro dato muy importante que ilustra sobre la prevaricación de las autoridades norteamericanas. Para reclamar jurisdicción sobre el incidente Estados Unidos debía demostrar que había ocurrido fuera del espacio cubano. Los radares cubanos registraron el hecho dentro de nuestro mar territorial muy cerca de la ciudad de La Habana. Los radares norteamericanos ofrecían datos confusos o que se contradecían entre sí. La misión investigadora de la Organización de Aviación Civil Internacional (OACI) solicitó las imágenes tomadas por los satélites de Estados Unidos pero Washington se negó a mostrarlas. Durante el juicio de Miami la defensa reiteró igual petición y el gobierno volvió a rechazarla. Ahora vuelve a reclamarlo Gerardo en su Habeas Corpus y Washington, otra vez, se niega a permitir que nadie vea esas imágenes. Son ya más de quince años de ocultamiento que revelan el carácter fraudulento del alegato estadounidense. Pero Washington ha logrado que nadie lo denuncie permitiéndole seguir engañando a muchos. La información es cuestión clave para alcanzar la libertad de Gerardo Hernández Nordelo, Ramón Labañino Salazar, Antonio Guerrero Rodríguez, Fernando González Llort y René Gonzalez Sehwerert. Para ganar esta batalla se necesita movilizar a mucha gente, a millones de personas, y desplegar un movimiento de solidaridad que sea verdaderamente amplio y efectivo. Cualquier aproximación a este problema, si tiene aunque sea un mínimo de objetividad, debe reconocer que estamos muy lejos de esa meta. Está comprobado que las grandes corporaciones mediáticas imponen un silencio absoluto sobre este caso, especialmente riguroso en Estados Unidos donde la inmensa mayoría de la población lo desconoce completamente. La ausencia del tema en esos medios no es reflejo de incapacidad profesional de los periodistas sino que obedece a instrucciones precisas, a la decisión política de silenciarlo que procede de los más altos niveles de Washington. Esperar que esos censores cambien de actitud es una ilusión sin sentido, sería practicar el autoengaño. Denunciarlos por ello una y otra vez, es correcto pero insuficiente porque nuestras reiteradas denuncias apenas tienen repercusión. Es mucho más, muchísimo más lo que podemos y debemos hacer. Ante todo hay que apreciar objetivamente el alcance que hoy tiene lo que debemos llamar por su nombre, la tiranía mediática global. No se trata sólo de lo que dicen o callan los periódicos famosos, las grandes cadenas de televisión o las agencias cablegráficas que deciden sobre la transmisión de noticias en todo el mundo. Todos ellos, unificados en enormes monopolios controlan y manipulan la información y extienden su influencia hasta quienes quieren ser alternativas a esa dictadura global, incluyendo medios que se autodefinen como revolucionarios. Hay mucha gente en el mundo que se esfuerza por hablar y hacerse oír con recursos muy limitados y han logrado alguna que otra vez penetrar la muralla de la desinformación y el engaño. Nuestros recursos son mucho mayores, los de las Universidades cubanas, sus profesores y estudiantes. Hagamos como los niños de La Colmenita y preguntémonos sinceramente ¿qué más podemos hacer?